I used to so love writing to you when you were alive. And now, even though you’re dead, I find I still want to write to you. We were all there because we’re all so proud of you. Just as I know you would be proud of all of us. And I made a speech. I’m always making speeches these days. I enjoy it so much more than I ever used to. I said you loved books and you loved a good library and you would especially love this one. It has just been refurbished in a really beautiful way and we all felt how much you would be at home there. And how happy you’d be that this was part of the Engender AGM, because Engender is an organisation that you were so proud of and was so close to your heart. 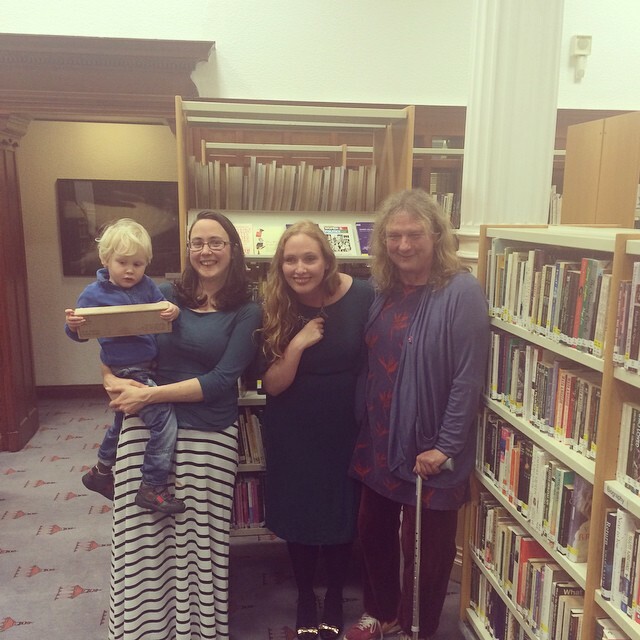 I remember how happy you were when the Glasgow Women’s Library was set up and how it encouraged you in a hard time. Because you achieved so much it’s easy to forget how hard it was for you to find your voice as an activist, as a columnist, as a feminist theorist and a women’s historian. It didn’t help that you were so far ahead of your time, but the main point was that your mum and dad loved you but didn’t really know how to help you. You always used to say that what would have made them happiest would be for you to have become a faithful member of the Plymouth Brethren, and marry a good Brethren fisherman, and settle down in Peterhead and have children and live miserably ever after. But that wasn’t you. And you had to make the most colossal effort to escape the expectations of your upbringing. Just as I did. And we both know how much emotional effort such a struggle entails and the feeling that somehow we lost our best energy to achieve it. I said that feminism was not something theoretical to you, but something you lived to its fullest. Of how you taught me that “The personal is political”. That it was important to live according to our beliefs and bear public witness to our values and that would change the world in more ways than we could imagine. And so feminism was your life and my life and we tried to live as though patriarchy was over. Transphobia was absolutely in the air we breathed and we all suffered. I so wanted to spare you and our children that suffering but I could not. What I did say, because I know it’s true, is that your love and your companionship and your fierce loyalty helped me get through. That without you I don’t think I’d be able to live and work as I do today. In fact I don’t think I’d have got through at all. I told them that we loved each other so very profoundly and were determined not to have a conventional relationship and above all not set up a nuclear family, because we firmly believed the nuclear family as an institution was patriarchal and damaging and oppressive. But then the world was stronger than us., somehow, and we did find ourselves in a nuclear family. But never a conventional one. And through all the difficulties we did manage to share childcare. I know you felt towards the end of your life that bringing up those remarkable young women was one of the best things you ever did. I still feel the same today. And then I introduced Katie, and she was very nervous, but spoke beautifully. She said: “I knew I was a feminist before I understood what the word meant.I just knew if it meant being as strong and amazing as my mum that’s something I wanted”. I hope you heard those words, somehow. And then she made a funny joke about the Kardashians, and then we did the ceremony. “We name this shelf the Sue Innes Memorial Bookshelf and declare her to be well and truly and usefully and happily open. Goddess bless all who make use of her”. And then on Saturday we helped Katie choose her wedding dress, me and Bex and a very old friend of ours who you were so very fond of and who has such a good eye for these things. Of course you should have been there too, though given your feelings about marriage I’m not sure how you’d have felt about it all. But her husband Ian is a good man, and so is Bex’s Brendan, and we probably would have discussed it all very seriously and then ended up laughing and laughing. As we tended to do about everything. I so miss the sound of your laughter. We went to a shop near where we used to live, Pretty Woman, and they were very expert and lovely. You disapproved of the shop, I remember, because the clothes expressed such a stereotype, and I used to cycle past it most weeks on my way to the supermarket and feel consumed with longing to wear one of the dresses in the window. And at the same time feel so silly and ashamed to want such a hopeless and ridiculous thing. And how lovely now to be living as a woman and not be troubled by such things and feel myself not especially interested in those dresses for myself at all. Instead just be free to admire how utterly beautiful my lovely daughter looked in the gorgeous dress we all chose together. And free to enjoy the joy and pleasure of doing that. I found myself feeling like such a proud dad, and such a proud trans parent in the most conventional way you could imagine. We all cried a bit the next day because you were such a wonderful person and even though it’s been ten years we still love you and miss you. And then that Sunday I was in church for Transgender Day of Remembrance and I read out the names. The names of all of us killed for being who we are. And it all fits together somehow. Because I know that in this dark world of fear and of rage birth and marriage and death are all sides of the same coin and that what binds them together is love. And that, in the end, is what endures. And so I feel courage through my tears.